Everyone wants to add USB ports to their home wall outlets these days. After all, what’s the point of old school wall adapters when most of your devices ship with USB cables? The problem, of course, is that most people don’t want to have to bother with shutting their power off and fumbling with wires. And the idea of paying an electrician to install them is just crazy. 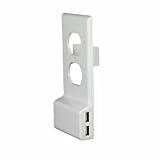 Here’s another option: check out the White Rock 3.0A Smart USB Wall Outlet. It’s basically a brilliant cover plate that snaps on in place of your old one, and it auto-magically draws power without you having to mess with any wires. It also includes fast charging capability as an added bonus. Easy and quick to install on any existing power outlet at home. No wiring. Just replace the plate with the plate provided. It takes 30 seconds only! Both USB ports have smart power transfer management controllers for fast-charging iPhones, iPad, iPad mini, Samsung, LG and other Android phones and tablet. Tamper-resistant material for maximum electrical safety. Full certifications for USA. 2 year warranty.